Advances in Electronic Test Industry for Aerospace & Defense - EMC Technologies Inc. Experts are predicting that the Aerospace & Defense industry will undergo a significant transformation over the next several years due to the advent of new technologies and a change in client requirements. As a result, electronic industry testing solutions will also need to evolve, leaning toward higher frequencies, multi-channel solutions, greater bandwidth availability, and increased functionality. The electronic test industry must be prepared to offer custom design and manufacturing in response to these changes, providing solutions that focus on repeatable measurements in the most critical areas. Functional test fixtures and adaptable test systems are instrumental in the development and testing of new technologies. What is Influencing This Change? Studies reveal that changing requirements with the industry have come about due to the progression of technology in the Industrial Internet of Things (IIoT) and renewed growth within the Aerospace & Defense industry as a whole. Increased spending by the United States and governments all around the globe are helping to drive growth in this area. The US Government alone has increased defense spending by nearly $25 billion with further increases planned in the coming years. Research and Development (R&D) within the Aerospace & Defense industry has received substantial investments, as demand for innovative technologies and new developments has grown. To keep up with the growing demands and challenges, the electronic test industry must partner with their clients to develop industry testing solutions that are in line with their increased requirements. EMC Technologies has evolved to work with a mix of industries, which has helped us to expand our abilities in order to meet their demands. 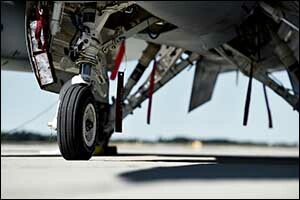 Higher speeds, tighter tolerances, wider temperature ranges, more adaptive test racks, custom functional test fixtures, and RF test fixtures – the needs of the Aerospace & Defense industry are expansive, and we are determined to provide them with custom design and manufacturing that will meet their specifications. Our team of highly trained and experienced industry engineers and technicians stay on top of the latest testing advancements. We have developed highly custom interface test adapters (ITAs) to support military airplane programs and multi-national missile programs for our military and defense clients. Our wide variety of demanding customers has helped us to stay current industry standards and expand our reach into new areas of innovation and technology. EMC Technologies has a fully equipped machine shop and electro-mechanical assembly department that is capable of handling even the most demanding requirements. We work with the client to develop custom functional test fixtures and other industry testing solutions designed to meet or exceed their expectations. Our customers consider us to be a partner in their test challenges. This is key to our success as well. We take pride in the loyalty that we have earned from our clients over the years, and we strive to continue growing, expanding, learning, and reaching to ensure that we are able to keep up with their ever-increasing needs and demands. Faster speeds, new technologies, smaller targets, and other challenges are met head on to ensure that we provide our clients with the absolute best solutions available in the electronic test industry. Our goal is to keep listening to the needs of our customers, working to attract the best and brightest that the industry has to offer, and by continuing to develop our knowledge and expertise in the latest technological advances that matter most to our clients. Some of the areas where industry test solutions are needed the most include radar and electronic warfare applications, military communications, satellite and intelligence, surveillance and reconnaissance, and antenna technology. Our customers come to us because they know that our engineers are proficient in custom design and manufacturing within these areas. The testing systems that were design for these clients require much wider bandwidths, higher resolutions, and higher signal fidelity for consistent and repeatable results. Today’s computer-driven, high-speed, and high-bandwidth avionics and military electronics are really at the core of what is driving the need for advances in the electronic test industry for this sector. EMC Technologies began in the 1990s with the goal of becoming a world-class functional test fixtures company. Our initial focus was on the functional test needs of the military, however we eventually involved to include a mix of clients from the military, military contractor, and commercial consumer markets. Our ability to design and manufacture wired and wireless functional test interface equipment for such demanding industries has helped us to be a true leader within the industry. To learn more about our services or to discuss your needs for custom design and manufacturing with one of our engineers, give us a call at 508-672-0808. We are ITAR Registered and ISO 9001: 2015 Certfied to best meet the needs of our customers.